The FamilyBelle Shopping Cart is a user-friendly, full-featured shopping cart that’s pre-integrated with PayPal. The Shopping Cart offers all the tools you need to build a successful family reunion online store. For information or to sign up Click Here! Begin accepting PayPal payments using ELM Shopping Cart. Set up a PayPal Business or Premier account. Only Business or Premier account holders can receive PayPal payments using ELM Shopping Cart. All FamilyBelle.com family websites include the shopping cart connected to PayPal for payment processing. All you need to do to start it is to select the Shopping Cart feature from the built in webpage editor, then add your PayPal account id and add your inventory to the shopping cart. You can add as may items to your Shopping Cart as you like. Plus you can use the Shopping Cart feature on as many web pages as you like. This allows you to organize your items by category. 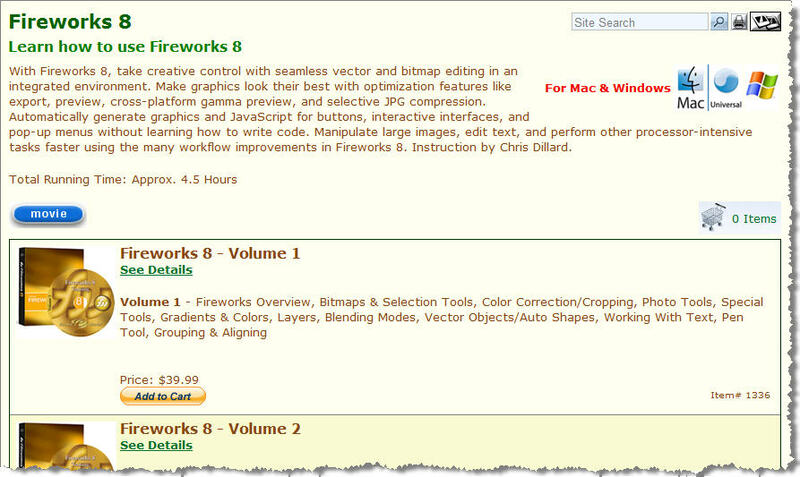 Screen capture example is from a one of our commercial customers that sells software training material. The Screen Capture below is of items in the Cart. Users stay on your website for the entire shopping experience until they are ready to check out. At that time the entire contents of the shopping cart is uploaded to PayPal where the, shipping and tax if applicable are added. Your customers do not have to be PayPal members to complete the transactions. PayPal accepts Visa, Master Card, American Express, Discover Card, Bank ATM cards and PayPal funds. The greatest thing about this approach is that PayPal is responsible for the entire Credit Card transaction. 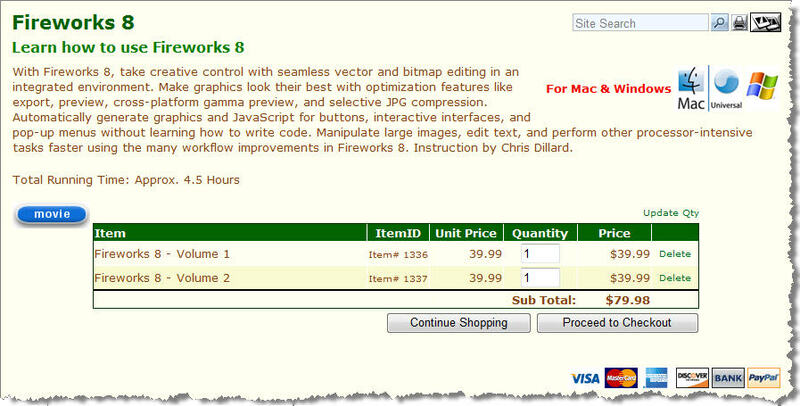 Another value add, the website search is integrated into your shopping cart. Family and friends visiting your website can search from any page on the website, including non Shopping Cart pages, and the results of the search includes items from your Shopping Cart's inventory.